I’m going to have a bumper crop of strawberries this year. I can barely keep up with picking a little bit in the mornings and afternoons to keep the varmints away, but sadly, it’s an ongoing battle. 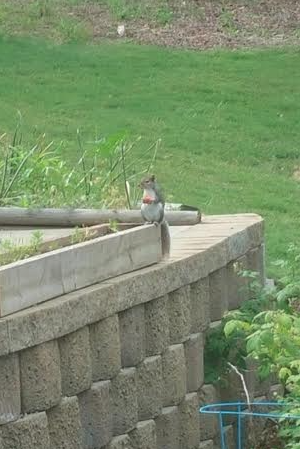 This little guy was having his breakfast while I was enjoying my coffee. I’d send Otis after him, but Otis is useless. He eats the berries, too. I guess it’s an all out war to grow tasty fruit. I can share, a little bit. The squirrel actually looked endearing while he was gnashing away at the berry. But those mockingbirds better stay away from the blueberries. Or else.